Olayanju Dada is a Nigerian born mixed media artist who lives and works in Germany. Born in 1969 in Ibadan, Nigeria, Dada grew up between Southern Nigeria and New Delhi, India. These settings exposed him to different artistic influences which are featured very prominently in his work. After graduating from Obafemi Awolowo University in Ile Ife, (Nigeria) with a B.A. 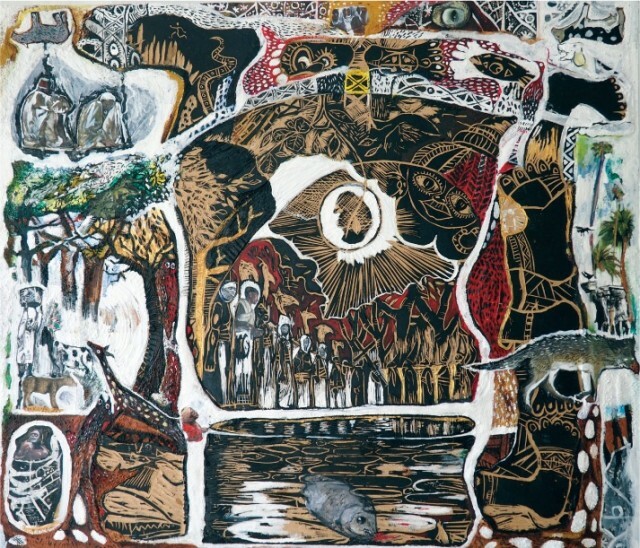 in Fine Arts in 1994, he continued with his artistic practice in Gambia while working as a teacher. In 1999, he moved to the UK and this proved to be a transformative period for him. As an avid storyteller, Dada appreciated how museums in London (such as the Horniman, Geffrye and the V&A) maintained a strong narrative in their exhibitions. This in turn inspired him to pursue an MA in Contemporary Fine Art Practice at Leeds Beckett University, which he completed in 2008. During that year he also qualified as an Art and Design teacher. After working as an Arts teacher for several years in the UK, Dada then moved to Germany in 2012, where he is currently based. There, he got involved in the youth transformative community art projects such as the ICJA10 Heavens Rock Spangenberg. He also continued to pursue and develop his art practice. Dada uses found objects and materials as his chosen medium - cardboard, old wood, household wares, sand, ink, and paper commonly feature in his works. His narratives are born of the balladry he finds in cloistering different textures and materials, making his work "an experimental collage." He uses a broad range of methodologies and executions to develop and create each piece. Influenced by artists such as Rauschenberg, Basquiat and Twins Seven Seven of Nigeria amongst others, Dada's work is vivid, full of colour, writing and texture. Dada says, 'My narratives are inspired by the poetics of congregating these dissimilar textures and materials of diverse origin and experiences. The focus of my practice is on translating displaced objects to a further state of meaning and symbolic essence, thereby creating a 're-entry' into the flow of cultural transactions and narratives." Dada looks beyond the singular use of objects - he elevates them as puzzle pieces in which the viewer may explore his unique universe.